Panic attack or hyperventilation is a state of breathing faster or deeper than normal. Healthy breathing is when there is a balance between breathing in and breathing out. Hyperventilation is caused by exhaling more than you in hale. This causes an in rapid reduction in carbon dioxide in the body. These attacks are rare, with most people reporting occurrences of 1 to 2 times in their lifetime. There can be many causes of hyperventilation and common triggers include emotions of stress, anxiety, depression, or anger. 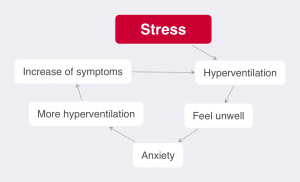 Occasionally, hyperventilation from panic can be related to a specific phobia, such as a fear of heights, dying, or closed-in spaces (claustrophobia) and often, panic and hyperventilation become a vicious cycle. The cause of hyperventilation cannot always be determined with sufficient accuracy (especially in the early stages) within the pre-hospital environment. Therefore you should always presume hyperventilation is secondary to hypoxia or another underlying respiratory disorder until proven otherwise. Hyperventilation may occur secondary to a life threatening condition such as asthma or anaphylaxis. Want to learn more about first aid? Why not sign up to one of our free online first aid courses!